Cimpian’s talk focused on research in three areas of education: English learners, gender achievement gaps, and LGBTQ youth. Cimpian first addressed issues in the process of reclassifying English-language learners, which school districts use to determine whether or not an English learner is proficient enough in the language to be reclassified as a fluent. Being reclassified introduces a host of changes to a student’s educational experience, specifically changes in programs and courses and often new teachers and peers. In 2007, the California Department of Education rescaled the California English Language Development Test (CELDT), which is used to assess a student’s proficiency in English, to be more difficult. Based on data collected in the years after the new version of the test was implemented, high school students reclassified as fluent English speakers in the Los Angeles Unified School District were 9 percent more likely to graduate. Cimpian went on to explore the gender gap in education (a topic of his recent Brookings Center article). Through his research, he found that a gender gap favoring boys in math develops in early elementary school, even though this gap is nearly nonexistent in state test results. His research also found that women aren’t avoiding the math and science fields because those fields are difficult. Rather, women tend to enter fields where they will experience less discrimination, and studies have shown that women tend to be discriminated against in the science, technology, engineering, and math (STEM) fields. Finally, Cimpian turned to the topic of research on LGBTQ students. Here, he urged caution, as data can often be invalid. 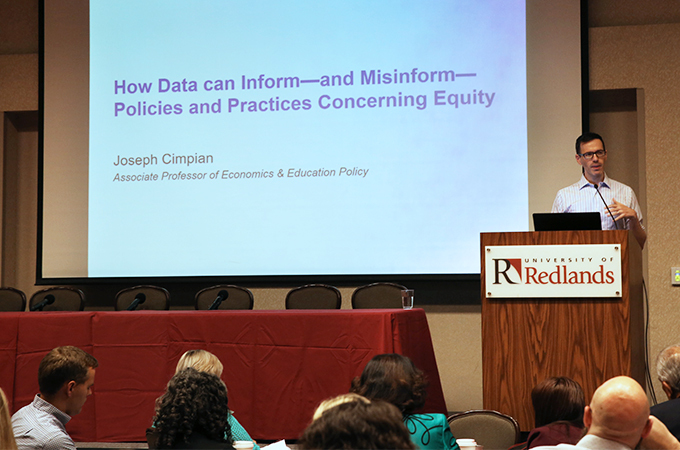 Cimpian introduced the concept of the “mischievous responder,” a student who provides false information in an anonymous survey. Researchers often don’t know if kids are telling the truth, and most studies don’t have a clear way to assess this problem. Other topics addressed during this year’s conference included homeless youth, Vietnamese dual language immersion, and Deferred Action for Childhood Arrivals (DACA) students. In addition, a forum facilitated a discussion among superintendents, including Judy White of Riverside County, Ted Alejandre of San Bernardino County, Mauricio Arellano of Redlands Unified School District, Jerry Almendarez of Colton Unified School District, Martinrex Kedziora of Moreno Valley Unified School District, and Michael Lin of Corona-Norco Unified School District. Learn more about the School of Education and the Center for Educational Justice.